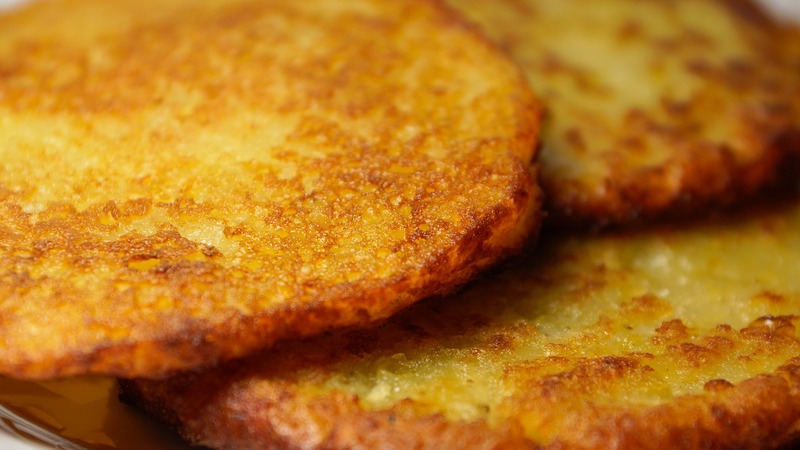 German Potato pancakes or "Reibekuchen" is a special and typical German dish for all occasions. They are very popular during the "Fastnachtszeit" (during German carnival) and in the Rhineland there is always a booth on the fairs selling them fresh from the skillet. If you like potatoes you should try this simple recipe. In Germany we eat them with apple sauce, and the best is to make apple sauce at home. Some say that Reibekuchen are made out of raw potatoes and Kartoffelpuffer from cooked potatoes. You can use both versions. Happy Baking! - Mix potatoes with eggs, onions and flour. - Heat oil/butter in a non-stick skillet and add about 2 tablespoons of the potato mix. - Flatten it with a wooden spoon. - Fry each side for about 1 minute. - Keep the fried pancakes warm but don't stack them; place them on a plate or baking sheet next to each other. Serve them on a warm plate and serve with apple sauce or lettuce. - Boil potatoes, mash them. - Spice with salt, white pepper, nutmeg to taste. - Fry them like in instructions above.